I know some people do a monthly empties post, but I basically just throw stuff into an empty David's Tea bag, and when it starts overflowing then I'm like yep, time to post about empties lolol. 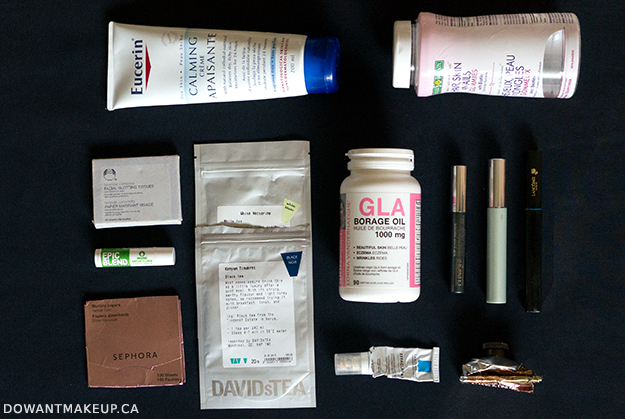 Depending on what new press samples I'm getting, it can take a very long while for me to get through even some of my favourite products! If I had to sum up the products in this post, it'd be "staple products". These are products I'm reaching for on a daily basis; the bare necessities (tea, hand cream, mascara, lip balm, etc) that I need to get through a day. Eucerin Calming Creme - I used this up really quick when I got an eczema flareup on my hands. The colloidal oatmeal is calming on the skin, and the mineral oil helps lock in the moisture barrier. I would slather this all over my hands and then put on some white cotton gloves to really seal the deal. Since then, I've discovered Eucerin Eczema Care cream, which I prefer a little more--it seems more hydrating and soothing since it's formulated specifically for eczema. Nature's Bounty Hair, Skin & Nails Gummies - in a previous post, I said I liked Nature's Bounty's non-gummy supplement but wanted to try the gummies next, because who can say no to gummies? Unfortunately I finished the bottle and felt I got better results in terms of reducing hair fallout with the non-gummy multivitamin. Of course I don't have hard evidence of this, I'm just guessing it was some kind of synergistic effect of the biotin + vitamins/minerals that the non-gummy version has. Lorna Vanderhaeghe GLA Borage Oil - I had a chance conversation with a nutritionist/naturopath about my eczema last summer, and she recommended, among other things, taking this specific brand of borage oil. I ended up not really looking into her other suggestions because the borage oil pills worked so well for me. At the time, I had been frustrated that the eczema around my mouth was "inactive" (not cracked, severely dry, or weeping) but still dry and red no matter what I did. I was genuinely so surprised at the improvement and how the redness went away within a week or so of taking this. I've experimented with other, less expensive brands of borage oil and still get good results too. If you also have eczema, I can't promise that you'll have similar results, but I'm so much happier with the condition of my eczema now. Hi folks! Sorry for the radio silence this week; I've been preoccupied with adjusting to a new job, as well as the next module in my program. Of course, I couldn't let the week go out without squeezing in a nail post though! 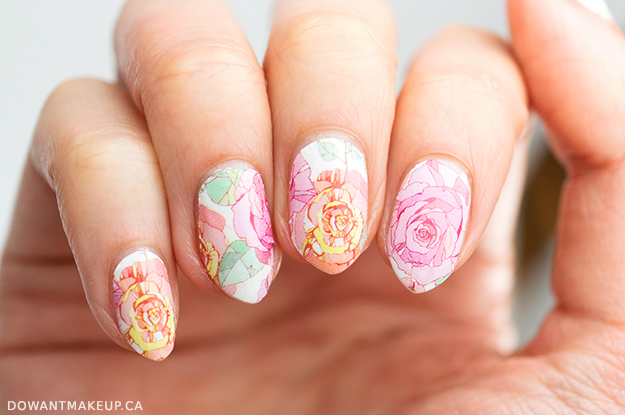 Here's another floral nail wrap set I received from Born Pretty. 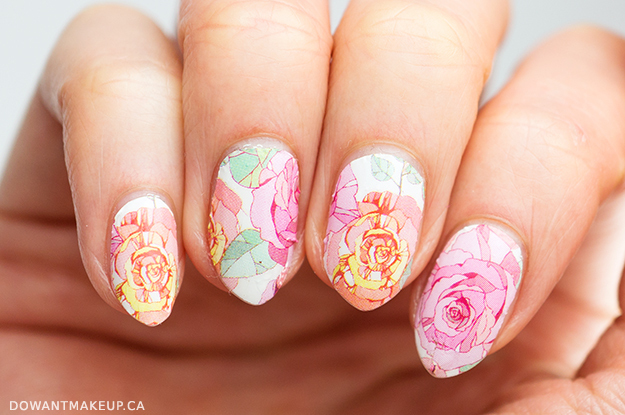 I loved the large rose design in shades of pink, orange, and yellow, and the way each colour is outlined makes it almost look like stained glass. 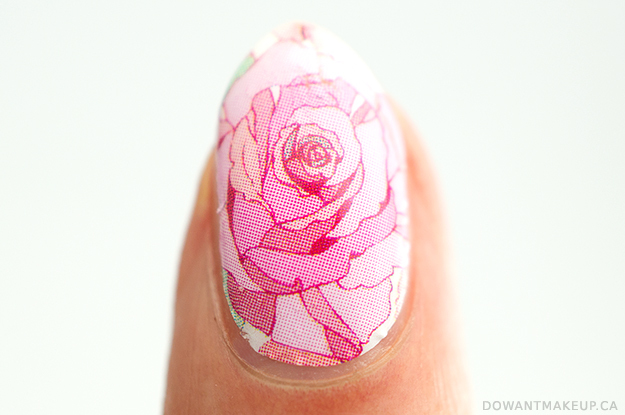 However, on the nail, the rose print looks a bit big and the overall effect becomes more abstract-looking than floral. Wear time, application, and removal are about the same as my last nail wraps from Born Pretty: tip wear will show fairly quickly, but the price ($1.69 USD) is reasonable for an easy and fun look that lasts a few days. For application tips, check out my previous nail wrap post.